With an assist from Forrest Gump, let me say that audio shows are like a box of chocolates: You never know what you’re going to get. This year there was plenty of good sound to enjoy and much of it was facilitated by tube electronics. Most of what was new or fairly new was in the way of power amplification. The trend of high-power push-pull designs has intensified in part due to the availability of the Russian KT150 beam tetrode. Visually, it’s a gorgeous tube, and with a plate dissipation of 70W, nearly three times that of the EL34, coaxing 200 watts from two pairs of KT150s in Class AB isn’t difficult. At the other power extreme, single-ended designs are alive and well. Two designs, in particular, based on the EL34 power pentode (surprise!) caught my attention, and I’m happy to include them in my show report. Analog tape fans should be familiar with Nick Doshi’s tape stage which has garnered many favorable user comments. The latest product addition is the V3.0 monoblock amplifier ($34,995/pr. ), a push-pull design using two pairs of KT150 beam tetrodes per channel. A 12SJ7GT pentode is used as the input stage. It is directly coupled to a long-tail pair phase splitter formed by 12SN7GT dual triodes connected in parallel to lower the drive impedance to the grids of the power tubes. The hefty output transformers are sourced from Sowter in the UK. Although the amps are officially specified at 180Wpc, this is a minimum spec, as they will typically make slightly over 200Wpc into a simulated speaker load at the factory during their burn-in process. This is a nicely executed power amp that did a great job driving the Joseph Audio Pearl 3 loudspeaker. In general, my impression is that all speakers deploying metal drivers could benefit from tube amplification as it can nudge such speakers toward a more natural voicing. My first close encounter with the Audio Research Reference 750 SE ($66,000/pr.) left me flabbergasted. The sight of 18 KT150 beam tetrodes crowning each monoblock was nothing short of amazing and really a bit frightening to a guy who routinely listens to low-power amps. I recall a time when 60Wpc was the norm for tube amps and 200Wpc was considered extreme. 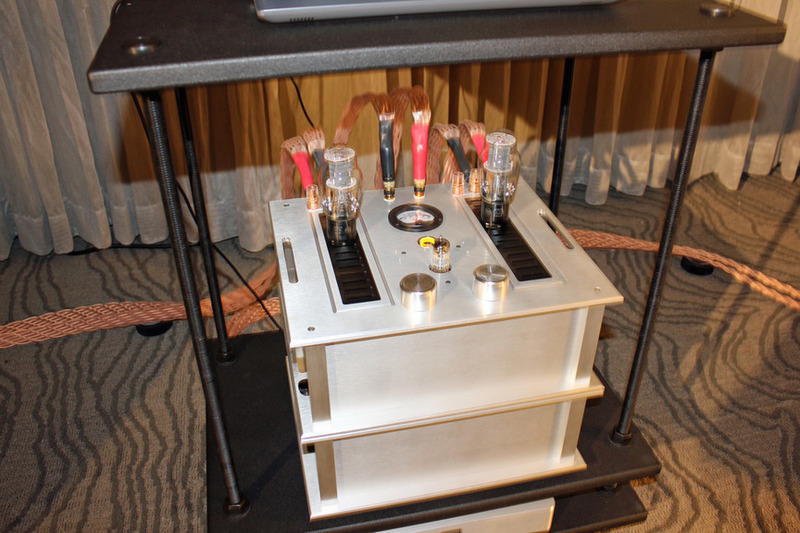 At 750Wpc, this is definitely the T-Rex of tube amplifiers, and really an amp in search of a suitable load. Was the MartinLogan Neolith the right loudspeaker for the ARC 750 SE? I wasn’t entirely convinced under show conditions and recalled that the Neolith had sounded better a couple of years ago driven by Pass Labs amplifiers. Dan Wright, ModWright Instruments, was at it again with single-ended tube monoblocks. The Ambrose A30 ($16,000/pr.) is rated at 32Wpc, Class A into 6 ohms at 0.1% THD. It deploys a pair of EL34s, connected in parallel in pure pentode mode. Bias is fixed, so there are no adjustment pots to diddle with. The output transformers were wound by Jack Elliano at Electra-Print and feature a third winding for use in Jack’s Iso-Linear circuit topology that the A30 appears to emulate. The EL34, derided by some as the KT88’s poor cousin, is really an exceptionally musical tube and the current Russian Mullard reissue is a very good-sounding choice. I’m so tired of KT88 push-pull sound that I find to be too controlled. The A30 amp sounded both dynamic and sufficiently lush to make my heart race when driving the new Daedalus Audio Zeus loudspeaker rated at 98dB sensitivity. How about a single EL34 operated in single-ended mode? That’s what the Rogers High Fidelity 65V-1 integrated power amplifier ($4000) is all about. Roger Gibboni is not your ordinary audio designer. He brings with him an extensive background in aerospace engineering, which is reflected in how products are designed and manufactured. The 65V-1 is intended as an entry-level product but is definitely not a watered-down version of one of Rogers’ big push-pull amps. The intent was to attract Millennials with a product that is not only affordable but also technically cool. I think that the combination of an iOS interface platform in the context of a single-ended tube amp qualifies as such. An iPad app that’s freely available from the Apple App Store allows the user to control volume, operating mode (ultralinear or triode), and to change inputs remotely. The combination of an EF86 small-signal pentode input stage and an EL34 power pentode has been fairly popular in musical instrument applications but has not been sufficiently explored in high-end audio. The combination of the 65V-1 and the Burwell & Sons Horn speaker sounded absolutely lovely. The Korg Nutube is in essence a new type of dual triode. It has a directly heated filament, a grid, and an anode and operates with triode-like characteristics. It is manufactured in Japan by the Noritake Itron Corporation on the same production line as its vacuum fluorescent displays. That’s why the anode is fluorescing in the picture. 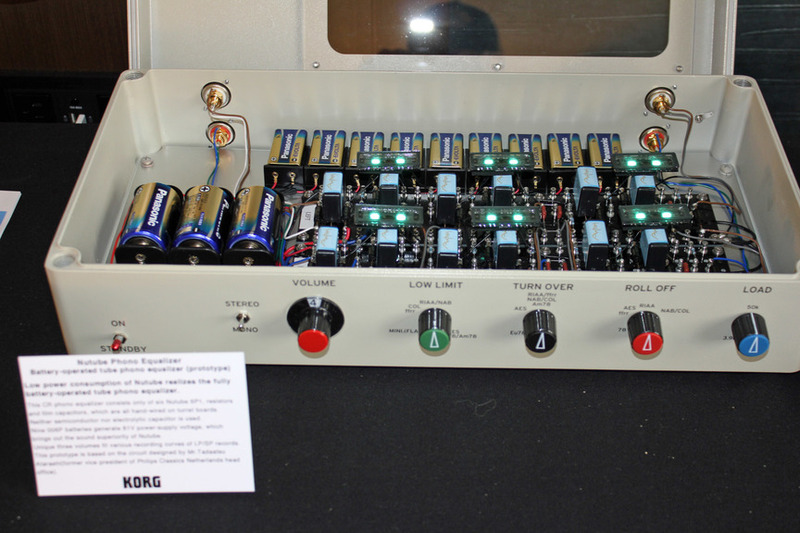 On display was Korg’s prototype phono preamp that uses these devices. You might ask, why do we need another triode and what’s wrong with just using a 12AX7? Well, heat dissipation is only a tiny fraction of the heat generated by a 12AX7. The Nutube is happy at an anode voltage of 80V, which makes it ideal for battery-powered applications. The Truth ($15,000) is advertised as the ultimate 2A3 single-ended triode amplifier and it certainly did a great job driving the Pure Audio Project Quintet15 open-baffle modular speaker. Three new and affordable 2A3-based amps were introduced, the DGA1 ($1800) pictured above, DGA2 ($2500), and DGA3 ($4500), where the acronym in the model name stands for “Damn Good Amp.” Keep in mind that these amps are rated at 3.5Wpc continuous and 6.5Wpc peak power—only high-sensitivity speakers need apply. Although there wasn’t anything new in the Zesto Audio room, except for their Allasso step-up transformer, this was my first listen to the Marten Django L loudspeaker ($9000/pr.) driven by the Zesto Audio Eros 300 monoblocks and a superb analog front end that included the Merrill Williams Audio REAL 101.2 turntable, Tri-Planar U2 tonearm, and a Benz Micro Gullwing SLR mc cartridge. For the money this system was a winner with its sound being totally engaging. In fact, I had not heard a Marten speaker sound better under show conditions. 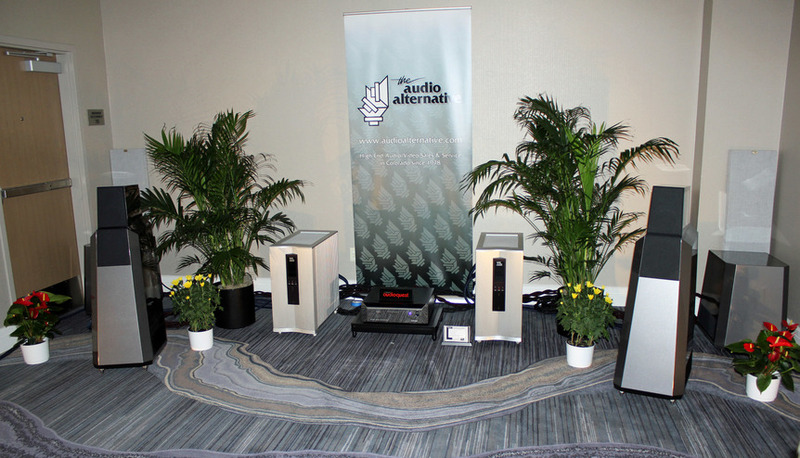 Again, nothing new per se in the Audio Alternative room featuring the Vandersteen Seven Mk. II loudspeaker ($62,000) with Sub Nine subwoofers ($18,900) and the VTL Siegfried Series II monoblocks ($65,000). Just reporting on my first-time listen to this system. With a Brinkmann Balance turntable, 12.1-inch tonearm, and a Lyra Atlas cartridge at the helm, this system had it all: tonal authority, transient speed, remarkable spatial resolution, and dynamic finesse. Apparently, Audio Alternative’s Rick Duplisea and Richard Vandersteen personally set up and tweaked the room. Kudos to this dynamic duo for what turned out to be for me the best sound at the show. The 350 monoblock ($9500/pr.) is an upgraded version of the model 305 and features increased energy storage in the power supply and improved screen bias and DC restoration circuits. It’s a bulletproof design with the ability to drive low impedance loads. Four- and even two-ohm loads are not an issue in terms of power delivery; think large quasi-ribbon planar and line source speakers. Driving the Amazing Line Source loudspeaker, the 350 made a good impression, though I had to listen from the back of the room, which always seemed to be crowded. I didn’t really mind, as volume levels were too high for comfort. Bob Carver, the legend, was on hand as well which enhanced the overall experience. I bumped into Mike Moffat, Schiit Audio’s chief designer, in the elevator. In the ensuing discussion, Mike explained that at sub $1k price points he’s playing horseshoes, trying to get close, but he expects that occasionally somebody will think that he hit the mark. That’s certainly the case with the 6SN7-based Freya line preamp ($699). I’ve been living with it for several months and find it to be a fantastic value, competitive with much more expensive designs. Linear Tube Audio’s ZOTL10 amplifier has been upgraded to the Mk. II version ($3200) with a new linear power supply and external transformer for the lowest noise possible. Older units are upgradeable to the new power supply. Frank Van Alstine informed me that the Fet Valve CF preamp ($1899) is now all tube, using 12AT7 twin triodes in the gain stages and 12AU7s as cathode followers. I seriously enjoyed myself in the Serious Stereo room. 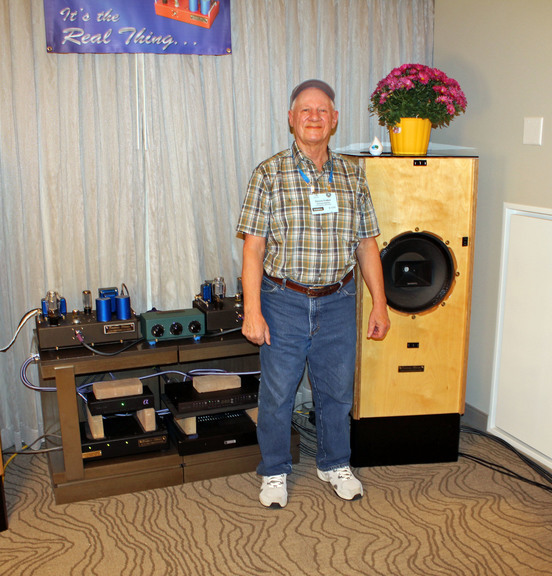 Dennis Fraker put on quite a show with his SET amp and loudspeaker which is based on Great Plains Audio’s Altec’s 604H, 15" Duplex driver—simple designs offering great sound. 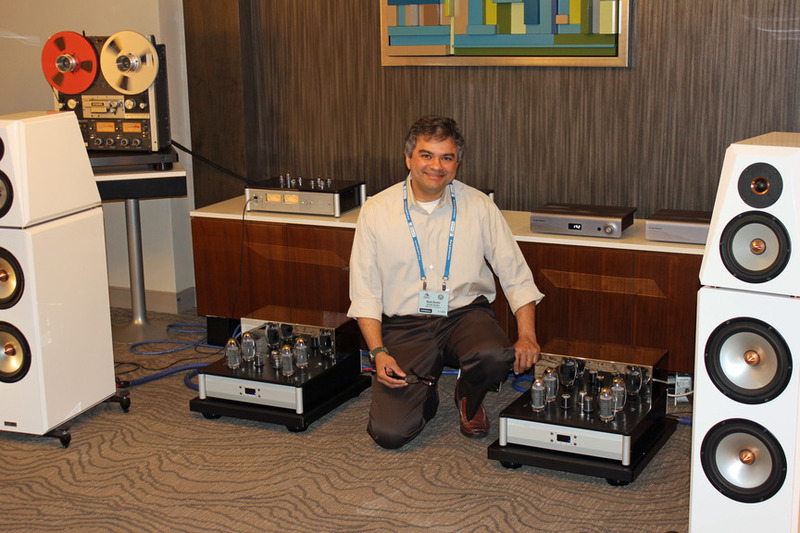 My first exposure to Thrax Audio’s Enyo modular integrated amplifier ($11,600) was extremely positive. What you get in one chassis is a multibit DAC, an upsampler, a network player, a phono preamp, and two vacuum-tube power amplifiers. 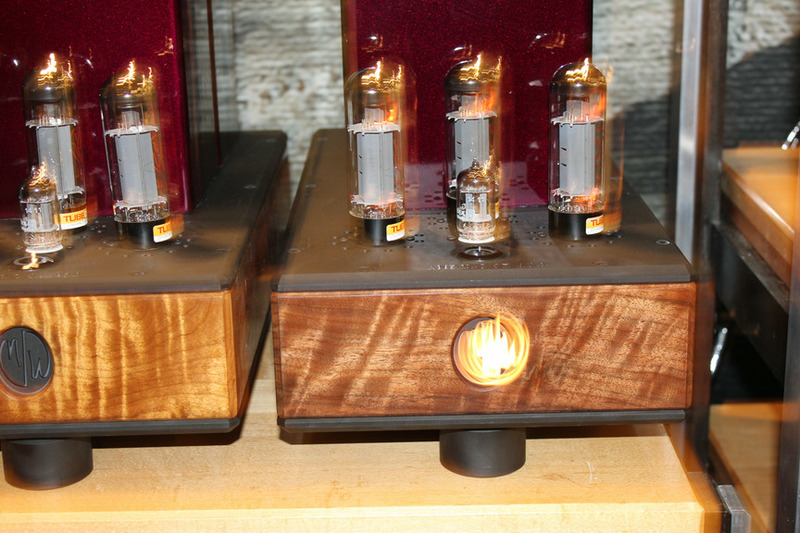 VK Music of Canada offers several Japanese tube amplifier kits. In particular, the new Elekit TU-8600 300B integrated amp looks to be a winner and is available with custom options such as Lundahl output transformers. Owner Victor Kung estimated assembly time for an experienced builder at about four hours. 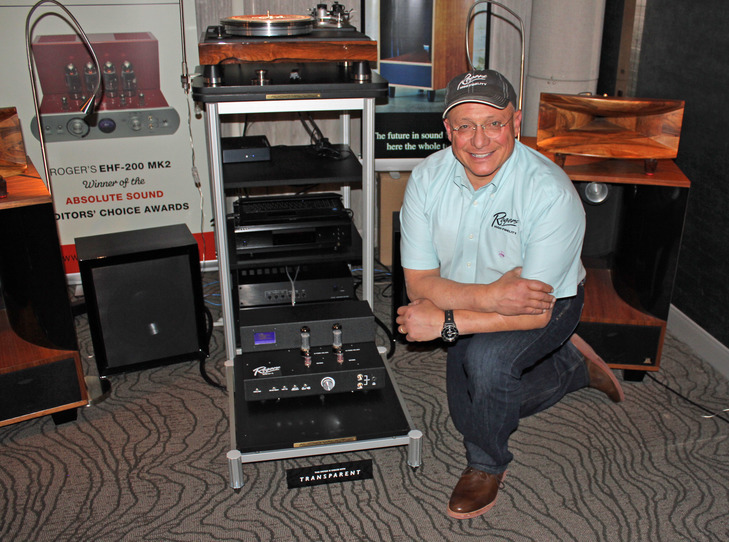 I made it a point to check out all of the entry-level rooms, which were set up to showcase complete analog and digital systems at price points from $500 to $5000. What stood out for me was Peachtree Audio’s digital setup consisting of the decco125 integrated amp (with the SKY WiFi streaming option) ($1999) driving the ELAC B6 loudspeaker ($269). Best Sound (Cost No Object): My heart belongs to Troy Audio’s Altec 604 loudspeaker but my brain insists that top honors go to the Vandersteen Seven Mk. II loudspeaker with Sub Nine subwoofers partnered by the VTL Siegfried Series II monoblocks. 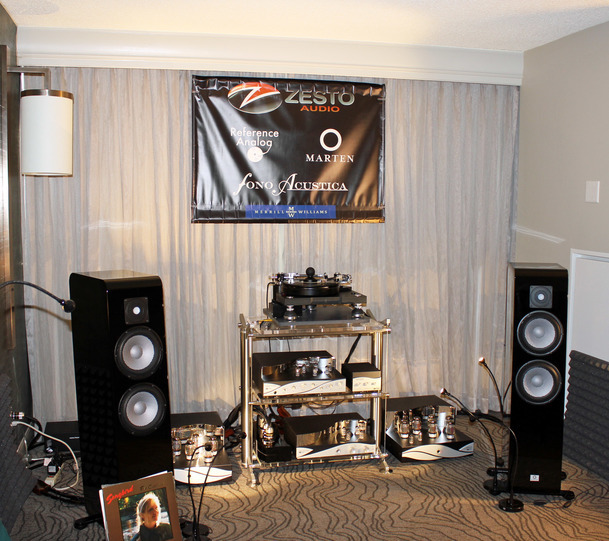 Best Sound (For the Money): Zesto Audio electronics and Marten Django L loudspeaker. Most Significant Product Introduction: Wilson Benesch Cardinal loudspeaker. Well, it has been around for a couple of years, but still new to most of us at RMAF. Most Significant Trend: Good old vinyl continues to compete successfully in an increasingly sophisticated digital world. Most Coveted Product: For me it was the new Lumen White Kyara Studio Reference Monitors. Excellent transient precision and bass line definition even under difficult show conditions.